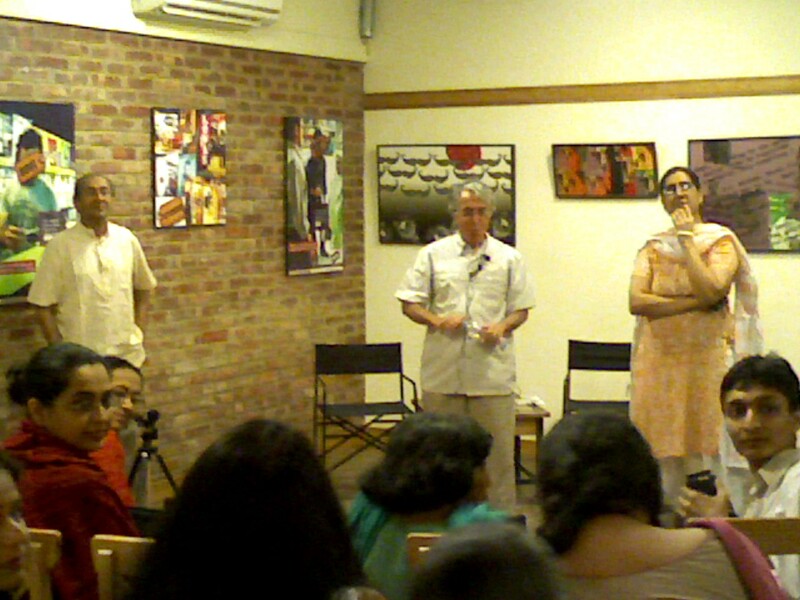 Jack introducing the Eqbal Ahmad book launch and panelists. 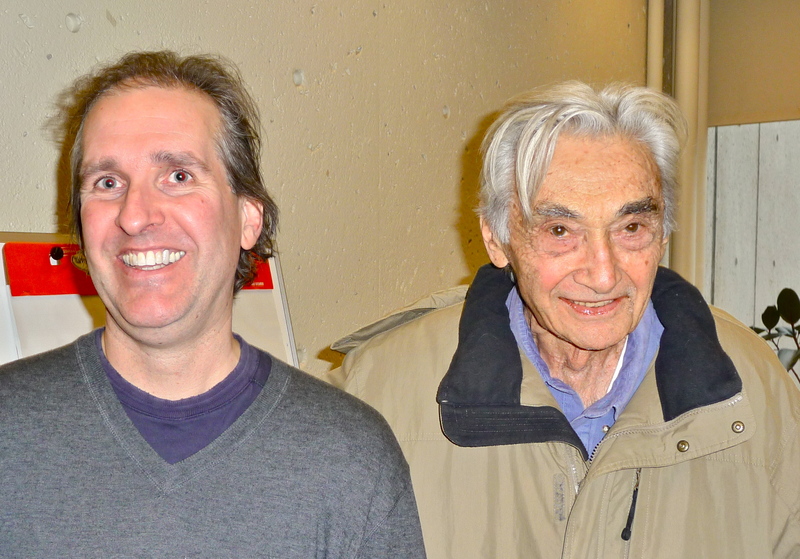 R-L – Chomsky, Margaret Cerullo, Stuart Schaar & me. We had been in email contact for some time but I met David for the first time at the launch of Eqbal Ahmad’s collected essays published posthumously by Columbia University Press in September 2006. 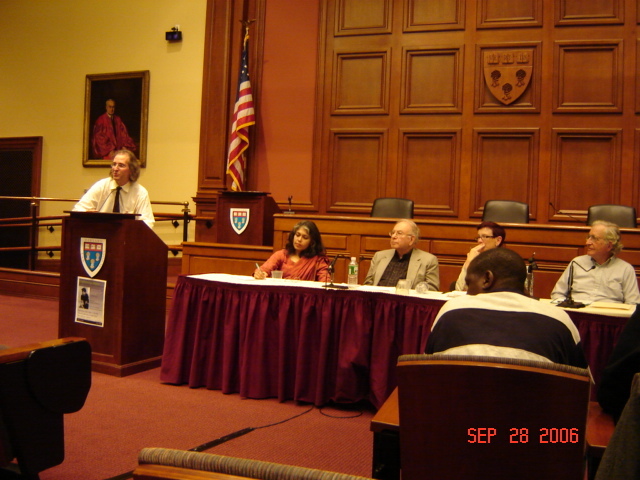 The launch took place subversively at Harvard Law School – subversively because HLS is a rather conservative place where the views of people like Eqbal Ahmad and his friends and comrades – David Barsamian, Howard Zinn, Noam Chomsky to name some – are rarely heard (particularly in the context of the Middle East, Palestine, Israel). But some pockets of resistance exist in those gilded halls. They include John Trumpbour (Jack), Research Director at Labor & Worklife Program, Harvard Law School. Jack and Howard: photo by Canadian labor leader Nancy Hutchison, taken on Jan 15, after Howard finished teaching the Program. “Many people know about Howard’s peace activism, but fewer know about his efforts to reach workers and the labor movement,” comments Jack. “Howard had a lot of issues with serious back pain during the past year, and he had some significant medical attention for this. He indicated that he was doing better, though not great… There have been some fine tributes to Howard. And the bloggers at the nasty right-wing website of David Horowitz have sneered at him, which is to be expected. “I would try to be fair to other points of view, but I wanted more than ‘objectivity’; I wanted students to leave my classes not just better informed, but more prepared to relinquish the safety of silence, more prepared to speak up, to act against injustice wherever they saw it. This, of course, was a recipe for trouble” – Howard Zinn in his autobiography, You Can’t Be Neutral on a Moving Train (1994). 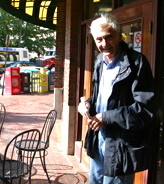 Jack was indirectly responsible for my own meeting with Howard Zinn, in October 2006. In May that year, he had put BJ Bullert, a documentary filmmaker in Seattle, WA in touch with me. She was interested in finding out more about the Tarbela Dam (her father had been an engineer there and she had lived in Pakistan as a 13-year old) and issues of displacement (That is another story). When BJ visited Cambridge in October 2006, we met for the first time since we had started corresponding. Later, when going to meet Howard, her old teacher, she invited me also. I was thrilled, and took along my copy of his inspirational, best selling book ‘A People’s History of the United States’. The book, currently #4 on the NYT non-fiction best-seller list, has sold more than a million copies and “redefined the historical role of working-class people as agents of political change” (as the LA Times obituary put it). We sat outside in the little courtyard at Dunkin’ Donuts opposite the Kennedy School and talked, and joked. He graciously signed my copy of his book and even more graciously asked me to sign a copy of a book I gave him, ‘Dispatches from a Wounded World, (BlueEar & BookSurge, USA & UK, December 2001, to which I had contributed a chapter, ‘The Hijacking of Pakistan’, pushed by Ethan Casey). We joked, bantered and exchanged ideas. Jack turned up later to join us. Howard then had another appointment and we all went on our own ways. But we kept in touch. Howard was prompt to endorse the ‘Academics’ Statement Of Support For Dr Ayesha Siddiqa’ in June, 2007, after the Musharraf government attempted to intimidate Ayesha following the publication of her book ‘Military Inc.: Inside Pakistan’s Military Economy’. The establishment pressurised the Islamabad hotel where the launch was scheduled to cancel the event. Ayesha’s phone service was disrupted as she gave interviews and she felt increasingly isolated and physically threatened. Howard was generous in his appreciation for an oped I wrote for the Boston Globe about Pakistan’s struggles a couple of weeks later, saying it gave him “a clearer picture of what is going on in Pakistan, which of course I cannot get in the media.” (I think he meant the ‘mass media, particularly television, because after all, the Globe is media…). In December 2007, I emailed BJ, Jack and Howard when David Barsamian visited to Pakistan for the Eqbal Ahmad Distinguished Lectures and needed some contacts. “Somebody ought to make a film about David,” quipped BJ. “Well, that’s nice news about the poster! In Islamabad!” exclaimed Howard when I forwarded it to him. Married in 1944, they were inseparable until Roz’s death in 2008. She was also an activist, and Howard’s editor. “I never showed my work to anyone except her,” Bob Herbert quoting him as saying, in his obituary for the NYT. Howard’s energy was amazing. Shattered by his wife’s passing away, himself well over 80 years old, he continued to write, give talks and interviews. 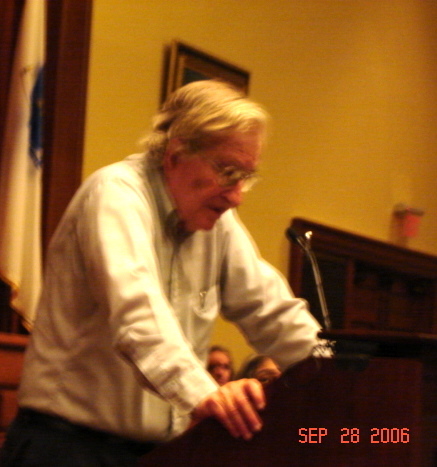 He also embraced new ways of getting the word out, as evident with the publication of ‘A People’s History of American Empire’, the comic book version of “The People’s History of the United States” in 2008 that combines cartoons, historical documents and photos, “making the whole thing visual, dynamic, and absolutely captivating,” as one review put it. A must-read for any Zinn fan is ‘the most dangerous man in America’ Daniel Ellsberg’s riveting tribute. 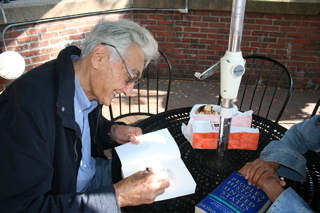 He recounts that he first met Howard Zinn at Faneuil Hall in Boston in early 1971, “where we both spoke against the indictments of Eqbal Ahmad and Phil Berrigan” for “conspiring to kidnap Henry Kissinger”. He recalls how Howard (who had been arrested in D.C.) returned to Boston for a rally and a blockade of the Federal Building, and was the last speaker at a large rally in Boston Common being addressed over loudspeakers. He paid for his words the following day when he was singled out for manhandling and arrest. 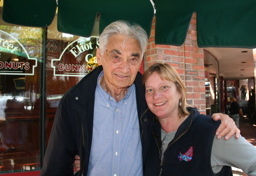 Howard Zinn, wherever you are, know that there are people here too who will always celebrate your life and work and who mourn your passing away as a world citizen who cared for humanity above all and did indeed give people “a feeling of hope and power”. 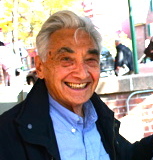 Compilation of tributes and articles related to Howard Zinn, including his own works, at the Howard Zinn website. I have read little by Zinn but have heard him on DemocracyNow! I was also surprised recently when I watched him make a small appearance in the semi-documentary – The American Ruling Class (2005). How I wish some people were immortal. My only encounter was in 1981 in the undergrad. history class at Austin. 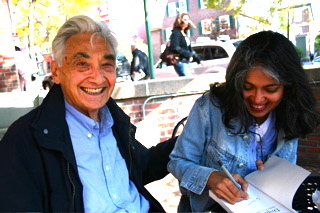 Since then I have never forgotten the name of Howard Zinn and the book ‘ A People’s History…’. It changed my perspective of looking at human history. It gave me the respect I felt for the vibrant people of America and their struggle. It edicted me to the richness of reading history as against a dry subject conveyed through high school texts. Above all, I learnt that there is always a part of history which is hidden from the eyes of present generation. Just one book, a very positive impact on my life. Been looking for u for a long time. would appreciate if you can get in touch with me.